After hearing Carol Oja give a lecture on Marian Anderson, a black woman and arguably one of the greatest opera singers of the 20th century, one thing that stood out to me is that Marian Anderson did not consider herself an activist. It is easy to question Marian Anderson’s hesitancy in this description of herself, especially from a contemporary standpoint when celebrity political activism is not so taboo. After all, Marian Anderson’s time of popularity was during the pre-civil rights era. She was still a black singer in an overtly racist society, and this placed limitations on her. Despite the overwhelmingly white field of opera and classical music, she gained popularity among greater American society. She had great vocal talent, but her “palatable” performances and public presentation of self likely contributed to her success as a black singer in a racist society. She appealed to common western society through things such as her western vocal training, western repertoire (although she did sing spirituals along with European repertoire), and western dress. This is not to say she did all of these things purposely to appeal to a greater, white audience. She was also extremely popular among black communities, and her pure vocal talent leading to much of her success cannot be denied. This point is also not implying that appealing to these traditionally western ways was necessarily against her nature. However, as one of the first famous black opera singers, her appeal to white, “traditional” opera culture likely aided her popularity gain on such a mass scale. Although Marian Anderson in many ways appealed to white operatic tradition, she also acted in a variety of ways to show resistance against the racism present in her life as a vocalist. She had performance contracts that prohibited segregated audiences, gave her famous Easter concert at the Lincoln Memorial (video clip shown above) in response to the DAR denying her performance at the Constitution Hall, and was the first black singer to debut with the Met. Marian Anderson’s impact on the Civil Rights movement was indeed significant. 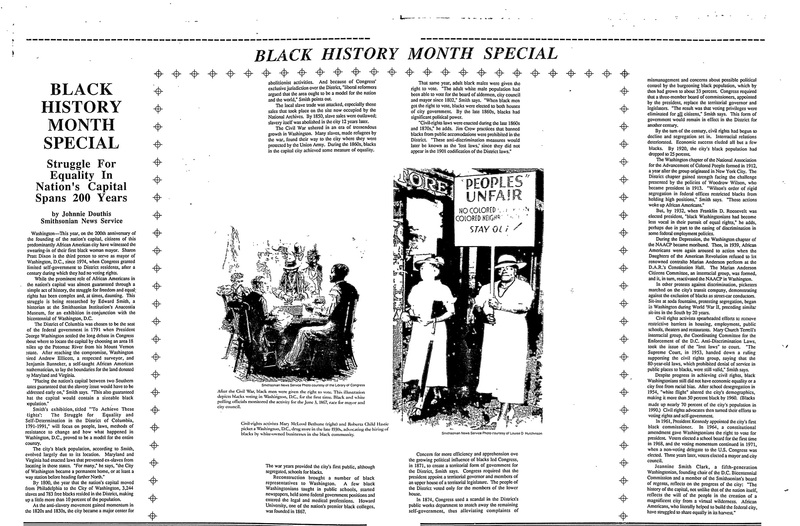 The newspaper clipping on the right, published in 1991, discusses the struggle for equality for black people over the past 200 years, and mentions Marian Anderson in the fourth full paragraph in the far right column. 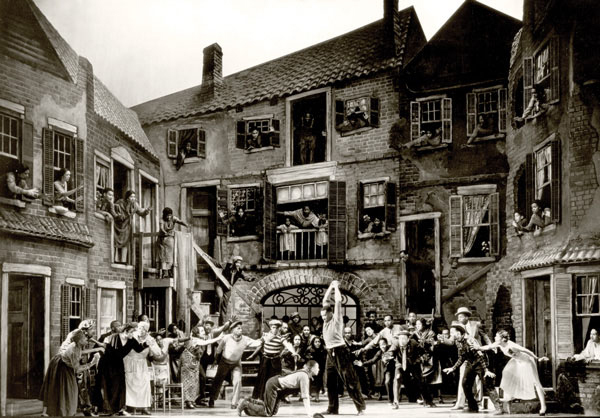 The impact Anderson’s Lincoln Memorial performance had in “reactivating the NAACP in Washington” is acknowledged, thus emphasizing her important role in the Civil Rights movement as a whole. Some may question Anderson’s denial of an activist label, and even criticize her for not going “all the way” in terms of her activism. Although Anderson’s true motivations behind this statement cannot be clear, one can give her the benefit of the doubt when appealing to Du Bois’ idea of “double consciousness.” W. E. B. Du Bois coined the term “double consciousness” as a phenomenon in which a person’s conception of self manifests under conditions of racialization. Thus, there are different types of self formation depending on one’s racial group and societal context. Du Bois argues that the “self” develops from others’ conceptions of us. For black people and other people of color, Du Bois believes a sense of “two-ness” forms due to their dual positions: one in the “dominant community that denies their humanity and [one in] their own community which is a source of support and an arena of agency” (Itzigsohn). There is constant tension between these two versions of the self that is manifested within people of color living in a racist society. Marian Anderson’s double consciousness manifests as her “self” that had to survive as a black singer in a white society and her “self” that was a black woman outside of a white context. It is possible that Marian Anderson resisted the label of activist because of tension between her two selves. She lived in a racist society and likely would have been criticized even more than she already was if she had been more explicit about her activism. At the same time, she acted in ways to resist the racism within society, as mentioned earlier. Double consciousness and tension of the two selves may not have been at the root of Anderson not considering herself an activist. However, it is important to note that Marian Anderson’s lived experiences likely shaped her perception of self and the way she acted as a public figure nonetheless. 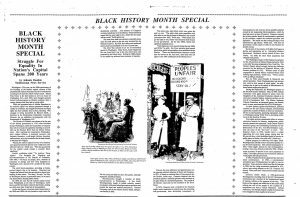 “Black History Month Special.” The National Chronicle, February 22 (1991): Database: America’s Historical Newspapers, SQN: 12BE222679916188. Feman, Seth. “Marian Anderson’s Presence.” American Art 28, no. 1 (2014): 104-17. Itzigsohn, José, and Karida Brown. “Sociology and the Theory of Double Consciousness.” 12, no. 2 (2015): 231-48. Marian Anderson singing at Lincoln Memorial in Washington, D.C., April 9 before 75,000 persons. Washington D.C, 1939. Print. https://www.loc.gov/item/2009633558/. My Country Tis of Thee. Performance at Lincoln Memorial. Video. Performed by Marian Anderson. 1939. https://www.youtube.com/watch?v=mAONYTMf2pk. Oja, Carol. “Marian Anderson and the Desegregation of the American Concert Stage.” 2016-2017 Fellows’ Presentation Series at the Radcliffe Institute for Advanced Study, Cambridge, MA, October 20, 2016. Van Vechten, Carl. 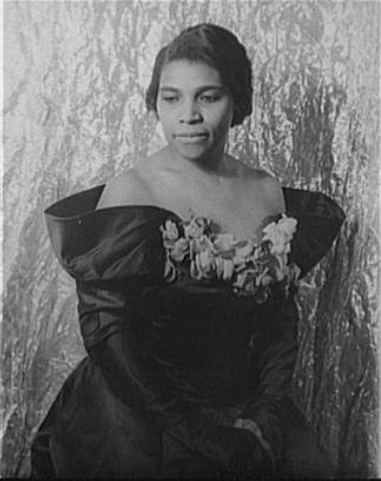 “Portrait of Marian Anderson.” Van Vechten Collection. Jan. 14, 1940. Print.